"Pie in the sky" or cash in the bank? Make no mistake: accounts receivable is too important for any business to ignore ... because if goods and services sold don't quickly become cash in the bank, it's just a "pie in the sky" that cripples your cash flow and pounds your bottom line. 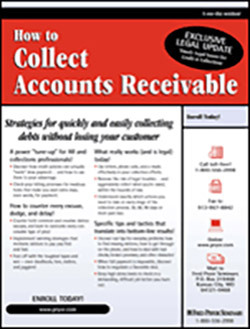 Consider the one-day difference: in just one day, this seminar will reveal the tips, techniques, and strategies that will enable you to excel at the tough job of collecting past-due accounts. You'll learn proven approaches that cut the time, frustration, and cost of collecting the money you're owed. This results-oriented seminar is designed to teach you how to collect more money faster .. Without sacrificing customer relationships and good will. You have nothing to lose … and everything to gain! You'll discover what a difference a day makes … because you'll learn practical, workable AR and collection techniques that succeed in real-world settings. Don't miss it! Is your credit policy clear, concise, and airtight? Review it with our comprehensive checklist. The latest “e-tactics” from the smartest collectors: how to use and document e-mail to charge up collection efforts! Billing and invoicing: Find out if you’re losing valuable cash flow through ineffective billing procedures. Surprisingly easy steps that produce more on-time payments … and reduce the total number of past-due accounts. Writing letters: what tone to use; how to write a reminder, an appeal, and a warning … and the appropriate uses for each. The accounts receivable paper trail — documentation procedures that ensure you have hard copy proof of the entire collection process. Internal policy check: Point by point, ensure you’re not overlooking vital contingency plans. Timely and on-time: Build a collection system that keeps you up-to-date and in control. No gains with shame! How to collect what you’re owed and keep your customer’s dignity intact! Strategies to help you get through to anyone, no matter how hard a customer tries to avoid your call! How to avoid losing the customers your company needs to keep … and how to evaluate which customers represent valuable relationships! The assertive collector: how to build more positive relationships, without falling victim to manipulation. When a usually good credit customer lapses … how to deftly handle special situations. Negative words and phrases that turn people off and hinder, rather than help, your efforts! How to motivate with the benefits of payment, instead of the dire consequences of non-payment. The basic types of debtors: Get to know them now … you’ll encounter them over and over again! Stallers, Jugglers, Deadbeats, Liars: tactics and strategies that work on the toughest types. Finding a “missing” debtor: Learn the tricks the experts use to quickly track down anyone! Excuses, excuses: Use these super-effective responses for virtually any excuse you’ll hear! Common communication mistakes: words, phrases, and approaches that don’t work … and can even stall or set back your efforts. Staying calm in heated situations: how to face anger, verbal attacks or criticism from unreasonable people. Avoiding stress and burnout: how to stay centered in a demanding, high-stress job. Weighing the costs of collection against debts owed: When does a collection effort become a money-losing proposition? Factors that determine when to negotiate and when to stand firm. Workable alternatives to “payment in full” … how to establish ground rules the debtor will respect. Negotiating strategies guaranteed to produce more favorable collection agreements. Listening and questioning strategies that get attention and spur action! How to ensure agreements stay on track and on schedule … and what to do if debtors fail to uphold their end of the bargain. The Fair Debt Collection Practices Act: your rights, as well as your debtors’ rights, under this important federal law. How standards of the Consumer Protection Act affect credit and collections. What constitutes debtor “harassment” … and how to steer clear of this legal risk. Should you resort to legal action? When it makes sense and when it’s just senseless. Lien rights: when you have them, and how to use them. Don’t just say it: specific information you should always document in writing. Mutual Release Agreements: their unique legal attributes and appropriate uses. Calling in the professionals: how to work effectively with collection agencies and attorneys.